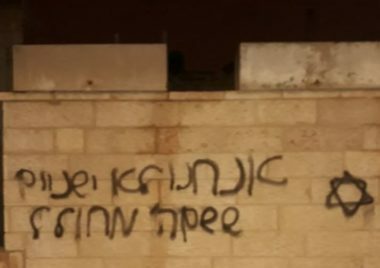 A number of extremist illegal Israeli colonialist settlers invaded, on Thursday at dawn, Beit Hanina town, north of occupied East Jerusalem, and wrote racist graffiti, in addition to puncturing tires. Local Palestinians said the colonists invaded the al-Gharabla neighborhood, adjacent to the illegal Pisgat Zeev colony, which was built on Palestinian lands. They added that the invaders wrote racist anti-Arab and anti-Palestinian graffiti, such as “Death to Arabs,” and punctured the tires of dozens of Palestinian cars. On Wednesday, Israeli settlers assaulted Palestinian farmers, in the Masafer Yatta area of the southern West Bank district of Hebron, and attempted to seize their lands.